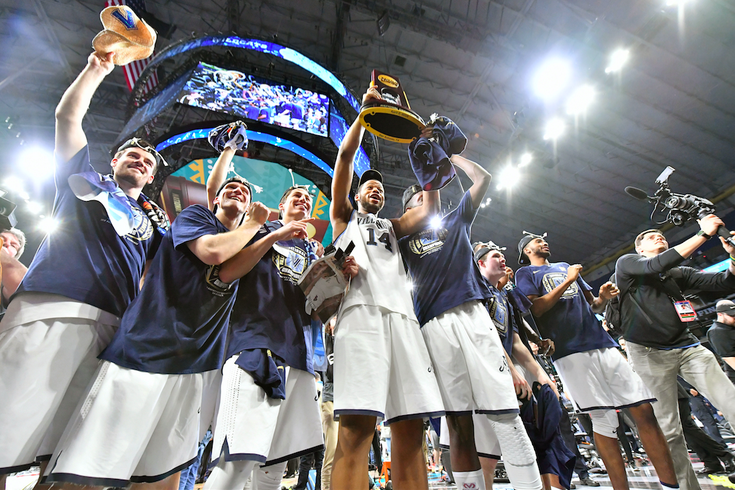 Villanova Wildcats forward Omari Spellman (14) hoist the national championship trophy after defeating the Michigan Wolverines 79-62 in the championship game of the 2018 men's Final Four at Alamodome on April 2, 2018. Philadelphia has gone from national punchline to gold standard in a matter of one year. With Villanova's 79-62 win over Michigan on Monday night, the team captured its second NCAA title in three years. On Thursday, there will be yet another parade in Center City, just two months after the Super Bowl champion Eagles hoisted Philadelphia's first-ever Lombardi Trophy. It seems fair to say that three championships in a city in two years makes that city a city of champions. Now the world can get used to hearing it. Eagles players took to Twitter after Villanova's victory to celebrate and let the good times roll. Major S/O to Villanova!! Philly stand UP!! 1st the SuperBowl now NCAA 🏀champions is say it's a great start to the year for sports in Philly!!! Plenty of others, from former Philly athletes to local figures and fans, also weighed in on what this streak of success means for Philadelphia. And finally, the great Charles Barkley, who says the Sixers will now win the NBA championship.